NHS England has worked with the Local Government Association, demonstrator areas, and our partners to develop the Integrated Personal Commissioning operating model. 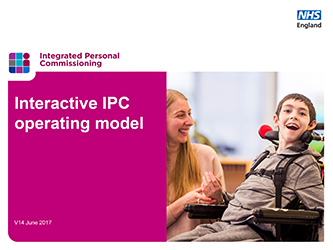 The operating model sets out the essential components of Integrated Personal Commissioning and provides a template for local areas to follow. It enables a seamless approach so that people and their families have the same experience regardless of whether their care and support is funded by the local authorities or the NHS. It provides a best practice approach for implementing personal health budgets. how carers fit within Integrated Personal Commissioning. For each part of the operating model we have produced resources to support local areas with implementation, including the delivery of personal health budgets.